For two years I would go by the abandoned Frank Cuneo Memorial Hospital at Montrose and Clarendon on my way to my apartment. It didn't matter if it was the middle of the day or late at night, I always thought, "That building creeps me out." After years of trying to find a new development for the site, it looks as though luxury housing will go on the site, a project which will receive about $14 million in Tax Increment Financing funds. This led to protests and criticism from Uptown residents upset with the project. Historically, Uptown has been a neighborhood where underprivileged people move. This also interestingly enough includes Appalachians, large numbers of which moved to Chicago following World War II. Residents of Uptown celebrate the diversity as it is a neighborhood where you can in one day get Mexican food from a taqueria, chicken from a place that feels lifted out of the '80s and Vietnamese food on Argyle. "When I became alderman, Uptown had well over 100 vacant lots, we had lots of empty, dangerous vacant buildings, we had over 500 abandoned cars on the streets, we had less than one-quarter of the streetlights we currently have on the streets. On some streets, you couldn't see anything," Shiller says. "We had a very small, strangled retail community. The area under the El tracks south of Montrose, now Challenger Park where people walk their dogs, was a common dumping ground for bodies. We had an entire four-block stretch where the sewer had collapsed. We had babies dying from salmonella poisoning because the sewer system was screwed up. It was necessary to rebuild the ward, and start from the ground up." The thing is that Shiller, who was fiercely independent while Daley was mayor, did all of this while not kicking out the people who made Uptown what it is. As she said in the Time Out, "Uptown is one place where -- regardless of your income, ethnicity, what language you speak -- you can live here. If you want to live in a place that's truly diverse, there is still such a community in the city." Among the more controversial things she did in her last years as alderman was get a mixed-use development in the Wilson Yard area of the neighborhood. The development included retail space, which included Target and Aldi. The remaining retail space has been occupied by a bank, Subway, Hair Cuttery and a yoga studio. Part of this development included affordable housing, located on top of the businesses. Having lived near the development I can say the property included a variety of races living in the units, much like my own building. It fit perfectly in with the rest of Uptown. It is worth noting the housing planned for the Cuneo Hospital site is supposed to include affordable housing. The problem with this is the definition of what constitutes affordable housing. The proposed property would have affordable housing units that are $1,050 a month for a one bedroom apartment. That is not an affordable apartment in Uptown. 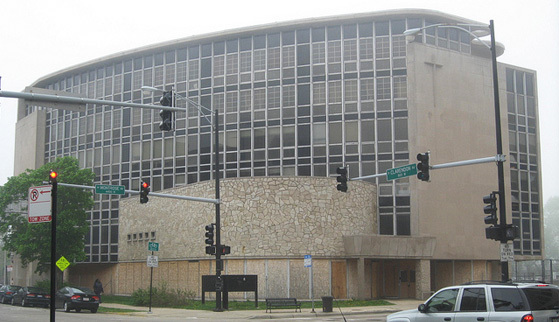 A key problem with the site possibly going to luxury apartments is that it seems as though Ald. James Cappleman has been pushing out affordable housing options since taking office as the alderman of the 46th Ward. Several of the Single Room Occupancy buildings, or SROs, in the ward have been shut down, notably Chateau Hotel in Lake View. Although some critics of SROs might point them as being hotbeds of crime, the ultimate reality is those particular buildings are the best option some people may have for affordable housing. Due to backgrounds or employment situations, SROs could be the only options for some people to avoid being homeless. The decline of SROs in Chicago has been going on over several years. As Whet Moser pointed out on Chicago magazine's website, the amount of SRO units in Chicago declined significantly between 1976 and 1986. As SROs have be shuttered and people have lost where they live, the buildings are being turned into studio apartments that start at $900, although Time Out reported the developer would like to find housing for the displaced residents. FLATS going in Uptown has also attracted criticism from residents. At the same time criticism can be easily lobbed at Cappleman over his relationship with the neighborhood's low-income residents. He received criticism last year after trying to keep a Salvation Army outreach truck out of Uptown for attracting homeless people. Never mind that Uptown already has homeless people--Uptown is home to Inspiration Corporation, which provides job training and experience to the homeless, notably in Inspiration Kitchens--Cappleman was afraid that a service that provides meals and counseling to the homeless would bring more homeless people into his ward so they could access an excellent resource. Cappleman eventually backtracked on this. Under Cappleman, Uptown has become a neighborhood lurching towards gentrification, almost becoming The New Lake View. The problem with gentrifying a neighborhood like Uptown or most neighborhoods in Chicago is it pushes out the people who create the character of the neighborhood. Can you imagine an Uptown without working-class and lower-class people of various ethnic backgrounds? Although some people may think they cause the problems, they are the business owners and, if you live in Uptown, your neighbors. Although Shiller did allow a Target to go into her ward, she did spend most of her 24 years as alderman trying to maintain the status quo in Uptown. The status quo in Uptown is not a neighborhood filled with crime where it's dangerous to walk the streets at night, but a vibrant community filled with people of a wide range of backgrounds and socioeconomic statuses. As Edward McClelland put it on NBC Chicago, "Holding together a mixed-income ward was a tough job, but for 24 years, Helen Shiller did it." If Uptown continues to have projects like the proposed development at Montrose and Clarendon go in, that magnificent quality of Uptown being a place for everyone could slip away. uptown does not need more high end. The Uptown community needs to attract more middle class residents, because until it does, stores and businesses, which bring in money and create jobs, will continue to bypass us. I left Uptown / Edgewater in 1997. I've visited periodically (and still do) to hang with friends. I've watched the gentrification blossom over anything east of Western Ave. for nearly two decades now. This development? Just another log in the fire as far as I can see. uptown has gone up and down over the years. it wasn't always a low-rent district. up until the depression it was more upscale (all of those big apartment hotels were full-service luxury rentals of their day). do we want to throw everyone out? certainly not. but we can't pretend that time doesn't go by and things don't change. we're talking about a lakefront parcel here, ask anyone anywhere if waterfront properties are cheap? this one is no exception and shouldn't be treated any different just because it's in uptown. let them develop it as they wish. we're not even talking about displacing anyone here ... it's a vacant site. hopefully uptown will regain some of its former prestige & the post-WWII decline of the neighborhood will be a thing of the past. As a former resident of the Chateau Hotel and one of the last residents to leave on 6/21/2013. former Lakeview Diplomat SRO Hotel, now known as Buffett Place and operated by Thresholds. Most of the nearly 140 former Chateau residents are not so lucky. During the last year I became an affordable housing activist for the Lakeview Action Coalition which later merged with ONE to become ONE Northside. In the last few years,BJB Properties, FLATS Chicago and a few other developers have displaced nearly 2300 low-income northside residents, most of them African American. Most are now on the south or west sides of Chicago, contributing to our city's re-segregation, contrary to established public policy. like BJB and FLATS Chicago nullify poor people's choices, disrupts their lives, and make some of them homeless, harms their mental and physical health, and in at least two cases that I know of led to former resident's deaths, shortly after their evictions. That is a high price to pay for a developer's greed or an alderman's desire to improve the housing stock. All I have to say is: hell yeah Robert. To learn more about Cuneo Hospital, which is eligible for nomination to the National Register as the work of master architect Edo J. Belli, please visit Friends of Cuneo on Facebook and see a list of resources on SeeClickFix at http://seeclickfix.com/issues/682239. For all the articles written about gentrification and Uptown (and there have been many), there has been surprisingly little actual gentrification in Uptown over the last decade. "The status quo in Uptown is not a neighborhood filled with crime where it's dangerous to walk the streets at night"
it required ignoring multiple mass daytime shootings in 2013 and the cities highest non-south/west side murder/drug/prostitution rates. Uptown is moving forward and I support the gentrification of the ward. There are still people that want to keep things status quo and want people to be dependent on them. We need more programs to teach people a skill to make them self sufficient.